(CNN) — A dog sheltered a newborn baby abandoned by its 14-year-old mother in a field in rural Argentina until the boy was rescued, a doctor said Friday. 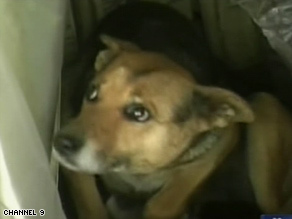 The abandoned infant was found in a field with this dog and her newborn puppies. A resident of a rural area outside La Plata called police late Wednesday night to say that he had heard the baby crying in a field behind his house. The temperature was a chilly 37 degrees, Salcedo said. “She took it like a puppy and rescued it,” Salcedo said. “The doctors told us if she hadn’t done this, he would have died. Dr. Egidio Melia, director of the Melchor Romero Hospital in La Plata, said police showed up at the hospital at 11:30 p.m. Wednesday with the baby, who doctors say was only a few hours old. Though the infant had superficial scratches and bruises and was bleeding from his mouth, he was in good shape, Melia said.